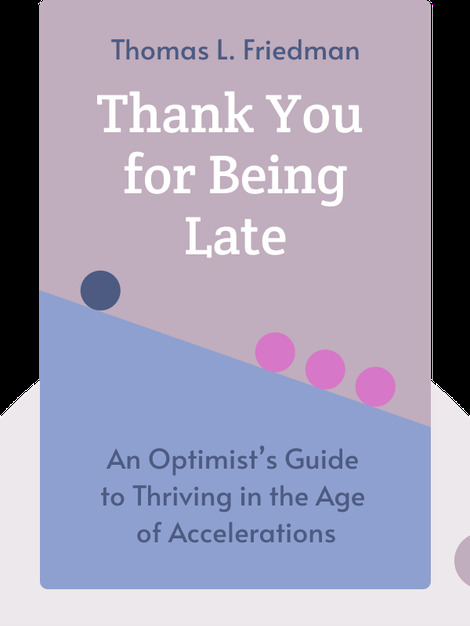 Thank You for Being Late (2016) is all about acceleration – of the economy, of technology and of our environment. These blinks explain why the world is moving at an increasingly rapid pace, outlining the dangers this trend can bring as well as what we stand to gain from it. 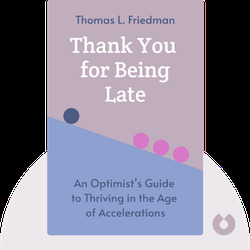 Thomas L. Friedman is a reporter, columnist and three-time Pulitzer Prize winner. He is currently a foreign affairs columnist for the New York Times and is the author of such other books as From Beirut to Jerusalem, The Lexus and the Olive Tree and The World Is Flat.